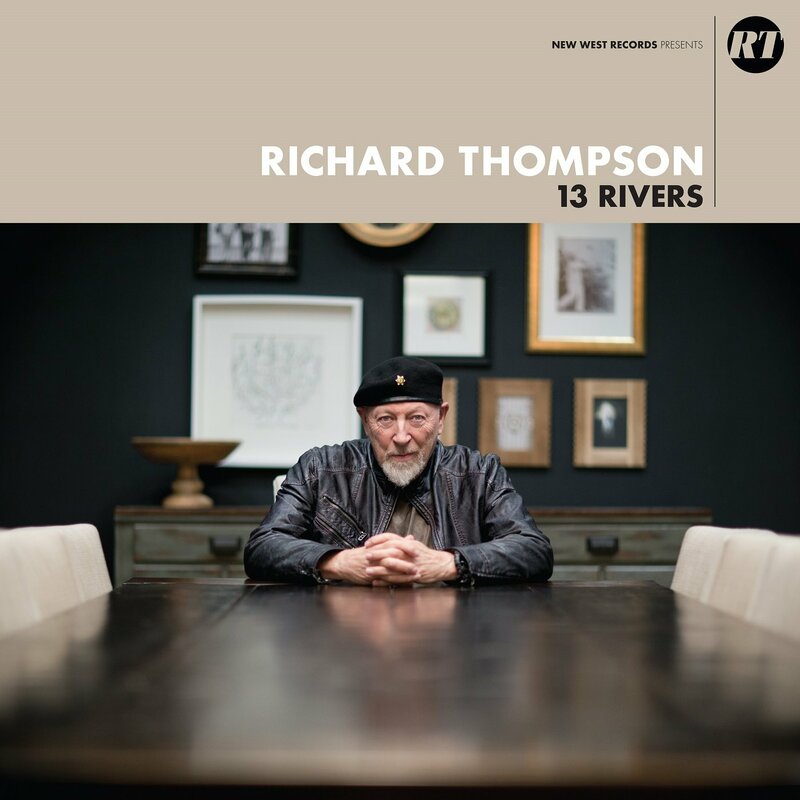 Much like with his Jeff Tweedy-produced 2015 album Still and of course with the recent Acoustic Classics ii, on 13 Rivers, Richard Thompson‘s first self-produced set in over a decade, the production is fuss-free. It allows his regular trio band room and time to really get their teeth into the arrangements and send these strong writings out into the world in a minimal muscular framework. Rivers is a toothy energetic album, with many of the songs being quick tempo and unafraid to let loose with sturdy electric lines and drum parts. ‘The Storm Won’t Come’, a six-minute belter of an opener, starts with a bass drum line and clean guitar, before Thompson’s vocal comes in uncannily Nick Cave-like and almost wearily announces ‘I’m longing for a storm, to blow through town’, before electric bass slips in beside the drums. ‘I’m longing for the storm, but the storm won’t come’, the narrator repeatedly complains, until a couple of minutes before the end, when the band break out into full-on jam mode to provide the yearned for sonic weather (it reminded me a little bit of the amazing climax to Bill Callahan’s ‘Summer Painter’). The production brings the ear in so close that it feels like a live show, with the four players (regulars Michael Jerome, Taras Prodaniuk and Bobby Eichorn join Thompson again here) showing how well they know each other musically by creating a truly exciting apex, before fading out. Cleverly, ‘The Rattle Within’ doesn’t lose any time jolting the listener back into the energy of the set; it would have been easy here to put a slow number on after the previous workout, but one of many strengths of this album is its absolute cohesiveness even throughout several shifts during its fifty-four minutes. Here Jerome’s ramshackle Tom Waits-esque drum beat introduces and underpins a voodoo rock opera, with Thompson clearly having a lot of fun with this material. In the album press, he admits that many of these songs came to him as a pleasant surprise and that feeling of grabbing the creative urge and running with it is what comes across throughout the running time. Take ‘The Dog in You’, a naughty late night lounge piece coming in after the twitchy dramatic fun of ‘Bones of Gilead’ (‘What’s my name? My name is trouble’). Again, the drums come in first, before an electric guitar just shimmers in the background and then Thompson’s voice arrives loudly and abruptly to sing a song of rebuke: ‘Please don’t say ‘that’s the way god made me’ / Please don’t say ‘that’s the way I am”. The sleazy arrangement here is a delight, a grown-up piece with a perfectly pitched and poised guitar solo switching places with the drums to end the song. As Thompson intended, the second half of Rivers is made up of more straightforward tracks (“we sequenced the weird stuff at the front of the record”), and the arrangement to ‘Do all these Tears Belong to You?’ is a clear sign of that decision, with its traditional rock form something of a departure from the slightly more unusual forms before. That’s not to say there isn’t still flare on display here, especially in the vocal, which seems to have a great time standing right at the front of the band and showing plenty of range. The bendy, wacky little guitar solo in there at the midpoint and end is also great fun and nicely contradicts the main focus of the song. It’s this slightly unorthodox tongue in cheek approach to some of the songs that highlight Thompson and the band’s confidence and understanding of each other and their ability to second guess and consistently surprise the listener, which makes for an entertaining journey. ‘My Rock, My Rope’ maintains the traditional approach to the slightly easier paced second half, with considered guitar playing sitting alongside a more relaxed drum beat to support a gentle and very pleasing piece of romance. Things speed up somewhat for ‘You Can’t Reach Me’, a fun rock and roll reprimand of a song that draws distorted comparisons with the slightly darker ‘Dog in You’: ‘Don’t give me that innocent stuff / you’re guilty all of the time’. It’s a clever mirror put against the earlier song to link them while highlighting the album’s shift in form. Another comically nasty little grinning tune is ‘O Cinderella’, full of little gems like ‘you were talking to the mirror, I thought you were gone in the head’ while the backers chant ‘O Cinderella’ behind the lead. It’s probably the most lyrically out and out fun song of the whole set and again displays the creative delight and freedom we can only assume Thompson and the band have landed on. The prettiest and most leisurely paced song of the lot is saved for the finale, with ‘Shaking the Gates’ displaying the singer and band in wind-down mode, framing cracking lines (‘if life is for living, I’m your man’) with accuracy and quiet flare. The soft backing vocal is also effective here, helping deliver a closing song that’s not afraid to slow things up for a confident and mellow stroll across the line instead of the more adrenalin-fuelled songs towards the front of the album. Confidence is key here and throughout because it positively oozes from 13 Rivers, which is a powerful, intelligent, multi-faceted and beautifully performed selection of consistently strong pieces. It’s also a ton of fun and a genuine high point in Thompson’s career; a record that should be chewed on and discussed for many years to come. Did you try a different extractor? I use 3 to cover all contingencies. My Thompson d/l had no issues.